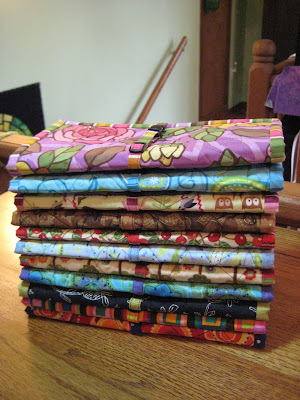 All of these were sewn with stash fabrics, I didn't have to buy anything except more snaps. I tried to make a nice assortment, not just ones that I like. lol You know, bright gaudy ones.... I threw in a couple of grown up ones, too, like the golden brown one and the Authentic black one and the light blue one. This is the inside of one- maybe you can see why it takes me so long to make them, but I think I've finally figured out a way to streamline the process a bit. I work on the accessories upstairs until I get to a point where there's handwork involved, then I move downstairs and watch the Olympics with Jim, or something else that we've recorded. (We really like having a DVR!) I call this "my homework." It helps keep him entertained too and not feeling so neglected. 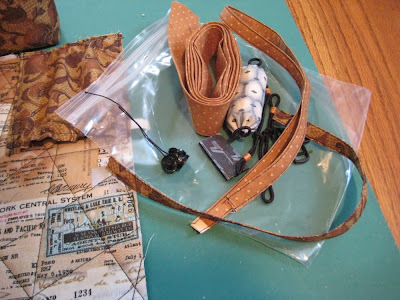 I do turning, basting, gathering, wrapping (like on the hair elastics), etc, and eventually the hand sewing part of the binding. Then I go back upstairs and sew with the machine or iron on the fusible Velcro or do the assembly portion of the program. When I'm working on so many, organization is important, especially because Nosey Parker is in a horrible stage right now of being kind of rambunctious and destructive. Nothing is safe from her and I can't even leave my typical piles of things lying around like I usually would. 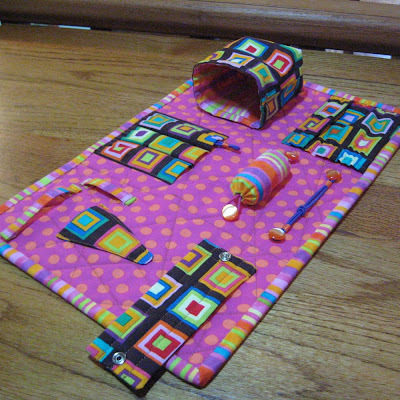 I make up little kits for each caddy when I am doing a bunch at one time. This way I know that I have everything I need to complete the project, the kits hold the little things as I complete them and also the things I haven't used yet, like the binding, the Velcro, the cat collar buckle, buttons, I even make up little containers with all the snap components in them (not shown). Since I live 25 miles from the nearest shop where I can get most of my "ingredients", it's important to me to know I've got everything I need before I start. Otherwise I get stalled and I just hate that. I had 14 of these bags on the table and SOME LITTLE MONSTER decided they were toys and batted them and chewed on them and I found them all over the place. Now I have to hook them all together on a chenille stem and tie them to the wall! lol She's so rotten. It's not like she doesn't have 400 toys scattered all over! And this is my excuse for being so absent lately- I've been sewing my fingers to the bone! I've got all 11 of these in the shop now, that's a record for me and gives my customers great selection, I like that. And hopefully I won't have to make any more of these for a while! At least, not so many at once. Of course, the tutorial for this caddy can be found over on the sidebar, to the right. And a tip- if you're doing a bunch at once, group them by thread color so you're not always changing the thread. I did 3 with black thread, 3 with blue thread, 5 with brown and I have 3 more to do with black again. I hate changing thread, it's such a waste of time to me, so that's why I do it like this. There you have a little peek into how I do mass-production. Hope I didn't bore you too much! And all so worth it because those are just so lovely! Wow there is a lot that goes into them. But it's so worth it. They are fantastic and I love the colour combinations you used! Well done all that work! Wow...you've made so many! My sister actually made me one of these for Christmas! It was a great little surprise! Bum-girl. What's with the no international postage rate? You stinker. I'm having the Authentic one anyway - you'll just have to convo me postage once you figure it out! I SO need one of these - I'm losing a lot of needles when they're stabbed in the arm of my sofa! Eeek! You got a great system worked out! These look so colorful and practical!! These are amazing! I am going to have to check your etsy site out! I would like the hooter fabric one please - my older son will order it from you tomorrow - can you hold it for me? Lynz, yours is on the way as soon as our PO opens this morning. Thanks very much! I'm trying to get the best price on shipping, did some investigating this morning online. Karen, I put a reserved listing on the one you want, tell your son it's there for him to take care of at his/your leisure, it won't be going anywhere until he's ready. And thank you! I hope you like it as much as I do. Happy Moving Day! You guys DO know there's a tutorial to make your own, right? I just want to be sure you know- you could save yourselves a bit of $$$. Lookie lookie lookie...I think I'm going to hyperventilate! If you leave two of these things alone for a few days looks what happens?? They like to multiply don't they? What a great job! I love the fabric choices and the workmanship is perfect - as usual. Take care of those widdle fingers okay? And tell NP that being a little brat won't get her far. I think she's a little jealous of all those bags since they have taken up so much of your time lately. Or she's just being a little "punk" (like most youngsters her age)! Fabulous, Susan! 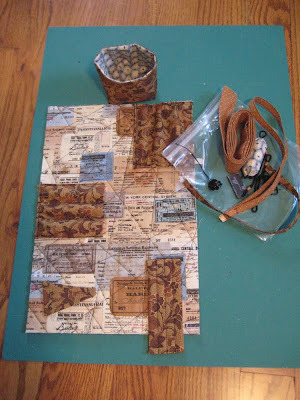 I love your fabric pairings!!! And it was fun to read about how you organize it all. Hi Susan! This is Alia from Muscat! I am using my beautiful Santorini fabric one I ordered from you! I added some of Uki's (my attempt at recycling!!) bells. They, unfortunately are blue and purple. I will send you a photo. When I come home to the US this summer; I will pick up some bells in the right colors! Thank you so much for this! I took it with me to the Dubai International Quilt Exhibition and I think I sold one for you! I hope that pans out soon for you!! Ladies and Gents; Susan puts a LOT of work and her work is BEA U TI FUL!! Bless you! 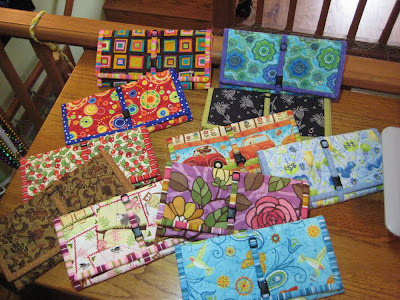 They are fantastic to have and a great gift to give one that sews! Take care and rest your hands!